When you’re visiting an area and want to check out multiple breweries and wineries, it can be challenging to work out the logistics of visiting various locations and also making sure to drink responsibly. That’s part of what makes the guided tours in Virginia’s Blue Ridge an excellent option! In addition to getting to take part in a tour that includes shuttle service that delivers you to multiple locations, you’ll also receive tastings and a local expert who can provide information about the stories behind the spots you’ll be visiting. Many tours also feature the opportunity to meet and hear from the owners and makers of these delicious products who are responsible for the all the behind-the-scenes magic. Whether you want to visit local breweries, wineries, or distilleries, there&apos;s a tour option for each in Virginia&apos;s Blue Ridge! 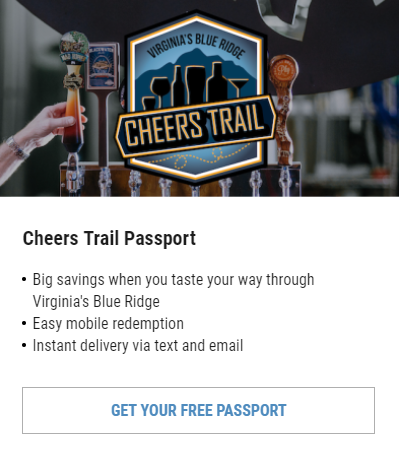 Don&apos;t forget to post about your tour experiences on social media and use the #VBRcheers hashtag. Tour Roanoke is a local company that provides a variety of food and beverage tours, including the craft beer tours, wine tours, and a craft spirits tour. Many tours are offered on a regular basis, and group options are also available for private tours. For wine aficionados, you’ll also love taking part in the complimentary cellar tours offered daily at Chateau Morrisette - an award-winning winery on the Blue Ridge Parkway. The following is a list of our craft beverage guided tour experiences in Virginia’s Blue Ridge.